knew I was in trouble when I attempted to stand. Something inside me dropped like a cannonball, and I heard the strangest creaking from the connective tissues of my midriff. “Pace yourself,” Tomoko said. But I just couldn’t. We were in the midst of a seven-course Italian wedding feast, and I was having an engineering emergency. Wine soaked into me as into parched earth. 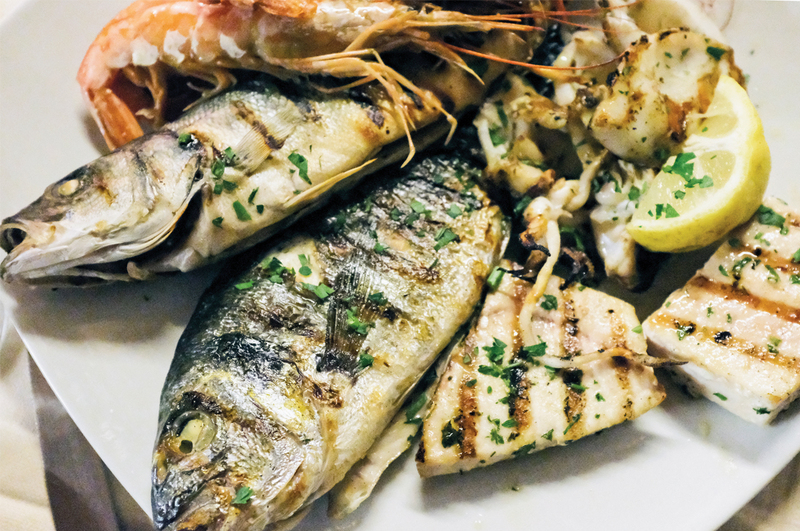 The relatively harmless opening salvo of prosciutto, local cheese and octopus salad had been followed in rapid succession by a tangy seafood fregola, a wonderfully soft spinach ravioli, and platters of delicate grilled fish and prawns. After this initial easing in, the chef tricked my stomach into further expansion with three cleverly placed rounds of palate cleansers. “Surely I have room for suckling pig,” I said, bargaining away my future self for immediate gratification. I broke out in profuse meat sweats, but the pig had been grilled all day over a wood fire. I took an extra-large helping. Our table bore what police blotters call “signs of a struggle.” In urgent need of fresh air, we waddled to the edge of the terrace, where the other guests were playing with matches. They encouraged me to light a candle suspended beneath a bag of silk. The candle heated the air, the silken bag expanded, and then, yes, slowly, it began to rise. Like dreams for the future cast into the wind, those tiny flames were fragile and beautiful as they floated away. And then I noticed mine was drifting inland, towards the mountains of an island in the midst of drought. I turned to a man who I knew was a local firefighter. “Did I just start a forest fire?” I asked. But my concerns were interrupted by the uncle of the groom, who wanted to explain the intricate plot of his novel to me, with the help of an interpreter who hadn’t read it. An older man led a traditional dance, grasping the newlyweds by the arms and jigging up and down, first one leg and then the other, as the limo driver played the harmonica. But apart from this brief burst of activity, there wasn’t any dancing. No one was physically capable of it. I didn’t dare ask how the wedding night went. Tomoko and I had come to Sardinia to witness the marriage of Luc and Amanda, two old friends from my hometown. But I first encountered this mysterious island as a desk-bound university student through the writing of D.H. Lawrence. The land seemed to run away into the distance as we crossed vast plains of bare hummocks, bracketed by the darkness of hills, with even darker mountains beyond them. And then I saw one of those mysterious stone towers that sets this island utterly apart from the rest of the Mediterranean. The indigenous Bronze Age people who inhabited Sardinia from the 18th century BC to the second century AD left some 7,000 of these nuraghi behind them. No one can agree on whether they were the defensive structures of clan-focused villages, granaries, or something else, but they have become visible symbols of the island’s stubborn independence. Su Nuraxi, the largest site left by Sardinia’s mysterious Bronze Age people. We entered the largest site of Su Nuraxi from a hole hacked high in its side, and stumbled our way to the centre through corbel-vaulted internal chambers. From within, I could see how these truncated towers had been built with massive unmortared stones. The central tower once reached as high as 21 metres, buttressed by four slightly lower towers in a quatrefoil pattern. It must have been a marvel of engineering. But we know nothing about the inner life of these people. No written records have ever been found. 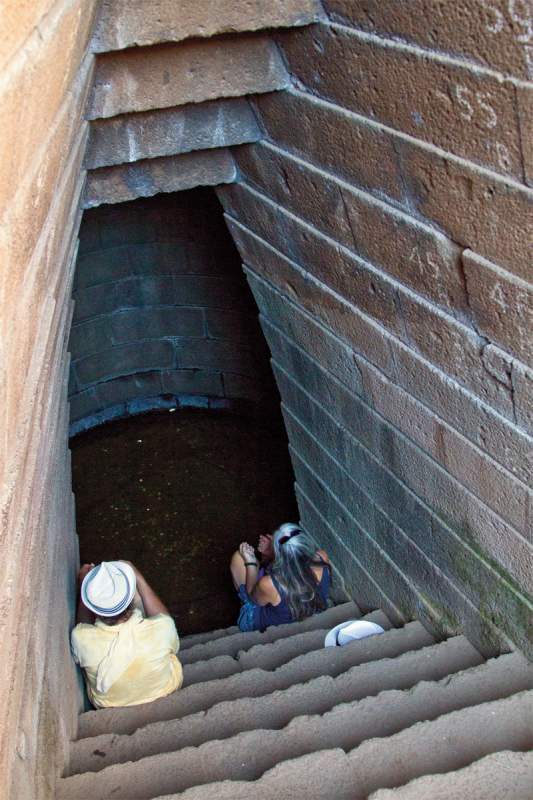 Perhaps it was the mystery of the nuraghe that intrigued me. 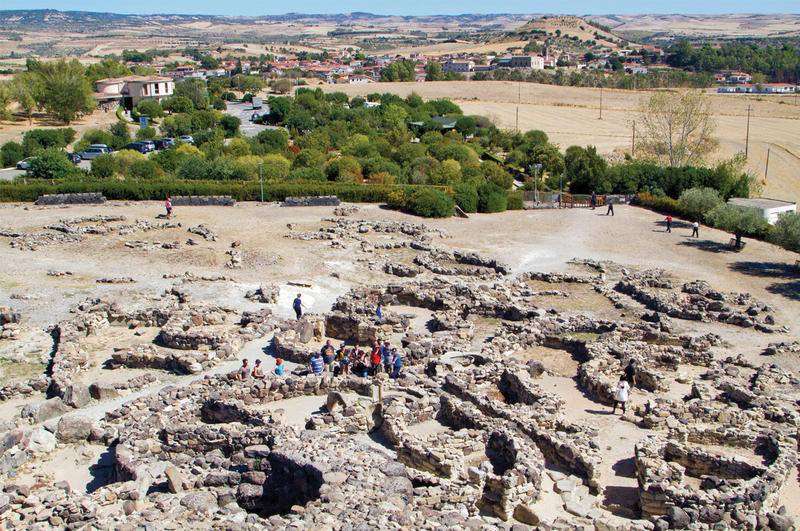 The material remains of this vanished culture take their strangest form at an inland site called Santa Cristina, where the walls of a large circular meeting hut are surrounded by a scattering of lodges. Next to them, a trapezoid opening in the ground leads down to an egg-shaped chamber and a freshwater spring. 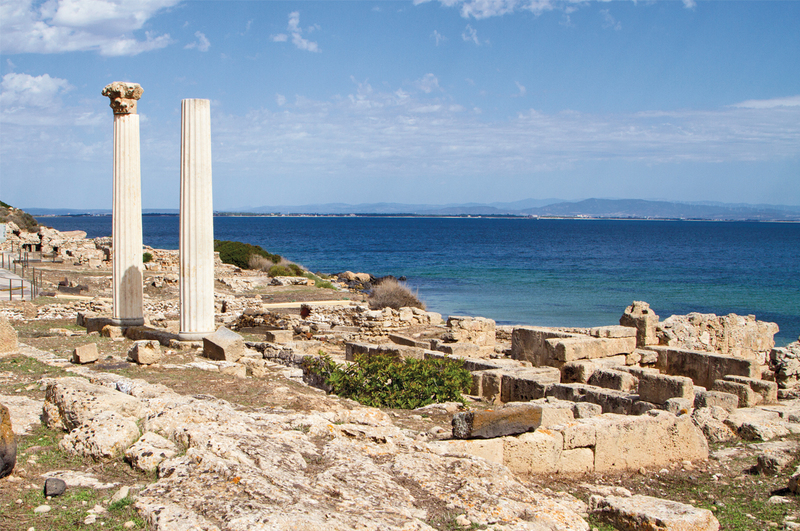 Seafaring Phoenicians settled at Tharros in the eighth century BC. “What are they doing?” Tomoko asked. I crept in again to see a middle-aged couple sitting side by side on the bottom step, with palms up and eyes closed, floating in their own new-age bubble of bliss. I’m not sure what they thought they were connecting to down there. We know nothing about the beliefs associated with this place, only that the Nuragic religion seemed to involve water and feminine fertility symbols. But those murky gaps in the past leave ample space for the determined imagination. The more literal-minded among us must leave the Nuragic peoples behind, for this island is rich in antiquities. Every Mediterranean power had established settlements in Sardinia. 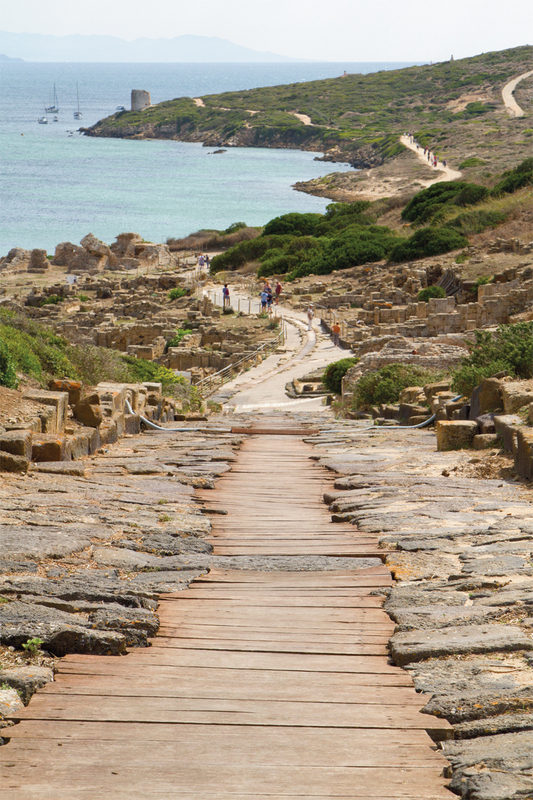 The seafaring Phoenicians beached their beaked prows on a dagger of land called the Sinis Peninsula early in the eighth century BC, and built their main settlement of Tharros next to a long-abandoned Nuraghic site partially covered in sand. They stayed for two centuries. The Carthaginians came next, in the sixth century BC, first as a rival of the Greek colonies in Sicily, and later in opposition to Rome. But the central Mediterranean wasn’t big enough for two major powers, and when the growing Roman Empire finally clashed with Carthage, Sardinia sided with the North African upstarts. Carthage was defeated in 232 BC, and the island was assimilated and occupied. Sardinia under the Romans was a place of exile. At their inland settlement of Fordongianus, I found stone-carved prayers invoking Aesculapius, the Greek god of medicine. The only spirit moving in the ruins that day was a small cat who brushed against my leg. We contemplated the nymphaeum together as I scratched her cheek. I was hoping for a good soak in the baths, followed by oil wrestling and maybe a little chat about Horace, but the thermal pools had cracked and emptied long ago. Sardinia had always been exploited for its resources, and invaders came and went, but the island’s rugged interior was never conquered. It was a wild country of desolate moorlands, craggy peaks, sheep-rustlers morphed into bandits and kidnappers, and bitter vendettas that spanned generations. But despite the island’s fierce reputation, we were nearly smothered with kindness. Kindness and an obsession with hugging. It didn’t matter how many times we met and separated in the course of a single day, when we saw our Italian friends it was as though Lazarus had returned from the grave. 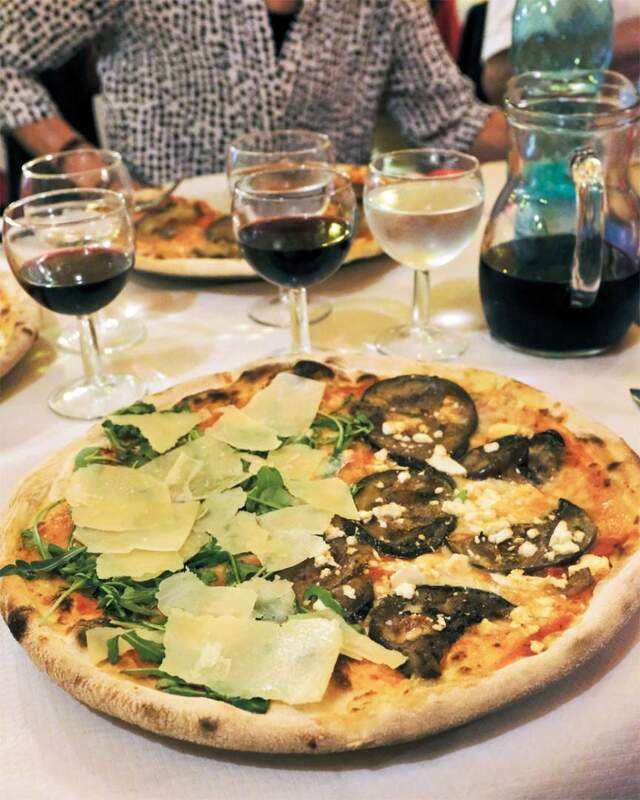 The gourmet Italian pizza of Sardinia. We had gathered together at a pizzeria called Take Away. I ordered mine topped with half Sardinian sausage and pecorino cheese, and half bottarga—sun-dried salted mullet roe, a local specialty. But to my intense disgust, the teenagers at our table were eating pizza topped with French fries. “I can’t count how many times I’ve met Italians who turned up their noses at pizza in foreign countries, or droned on and on about how Italian coffee is the best.” I slashed at my pizza with a dull knife. “I will never listen to that snobbery again.” In the corner, high on a wall, a television blared like Mussolini. How pleasant the town of Oristano was on a Saturday night. Somehow, when the sun turned its back, a chill wind had stolen down the alleys and taken up residence in the plaza. We strolled to the main square below the tower, where the best gelato shop was still hopping after 11 p.m. I asked for a scoop of pine nuts and caramel and took a seat outside. To eat ice cream under such conditions becomes an act of defiance against the approach of winter; a cone in the eye of autumn. On our last island day, we drove north along the coast in search of the ruins of Cornus. The wild spaces looked scrubby and uninhabited as we turned off the main road and climbed a gravel track into the low rolling hills of the macchia. We followed it until the track ran out and we had to abandon the car. A tangled growth of juniper and myrtle scented the air as I pushed my way through foundations of stone bleached white by the sun, tracing the floor plan of the basilica with its black basalt steps leading up to an altar, and a round brick baptismal font whose holy waters had long run dry. Most of these stone foundations were Paleo-Christian, but somewhere in the vicinity of Cornus, the Romans had crushed the last Carthaginian revolt in a decisive battle during the Second Punic War. The remains of two columns lay broken on the ground, one marble and one granite. Just beyond them, I found the stone shells of crypts long emptied of bones. It looked like some of the stones had been taken from older sites and repurposed, but there was no one to ask. I’d found the site using GPS coordinates. The only sounds were the buzzing of flies, a faint breeze off the distant sea, and the soft clonk of sheep bells. 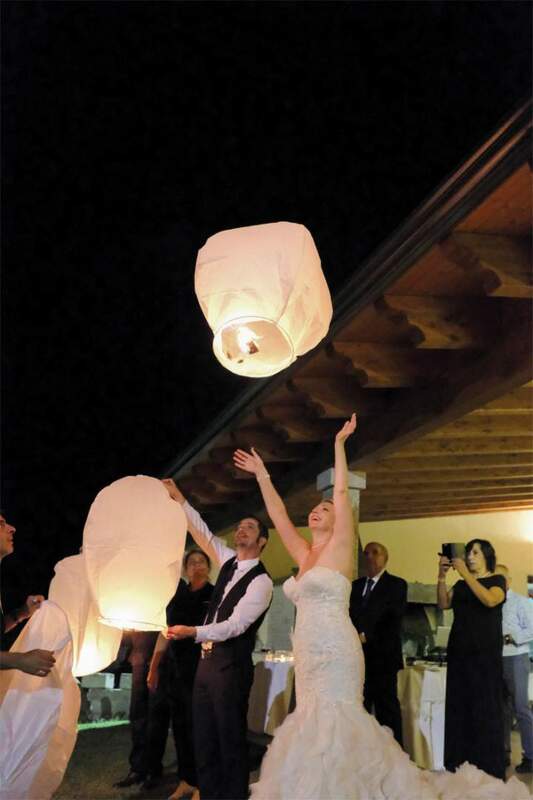 The bride and groom release lanterns of hope. Our explorations at an end, we stopped at small café perched high on a rocky cove, where we drank cold Ichnusa beer under an umbrella by the sea, and Memphis blues played from the small wooden bar. It was our last day in Sardinia and the light was fading fast. We still had towels in the car, and so sped down the coast to our favourite beach, where palm trees lined the road. The shoreline met the sea beyond a rolling expanse of dunes, not with sand, but with fine translucent grains of quartz-like polished rice. We had the beach completely to ourselves so late in the afternoon. A breeze came up, but the water held the warmth of the day even as it shifted between pale green and Mediterranean blue. In the distance, the silhouette of a ship pointed at Africa, passing somewhere far out to sea. I grasped a handful of polished quartz and let the grains trickle through my fingers. And I wrote these words in my head, picking up on the whispers of the island’s ghosts, as we the living assisted the imagination of the dead.